There are 135 posts in this topic. You are on page 1 of 3. ...according to this article in the Sunday Chicago Sun-Times. "That trend and a higher demand from collectors has been great news for Stern Pinball, which moved into a bigger 110,000-square-foot building in Elk Grove in 2015 and has increased the number of units it builds by 80 percent since then." They now employ 325 people. They have nearly doubled in just 3 years. I wonder if the profits are up that much as well...I say good for them. DA-YUM. This explains a lot - seems like more titles are being created, and the code updates.. they must also be wanting to stay on top since JJP is knocking it out of the park lately, and the AP titles are awesome as well. Funny to think after the Zidware and Heighway debacles (and DP) that things have turned around big time. You can't fault Gary for having a bad business plan, he managed to make it last through the early 2000s, and we all have to thank him for that.! And that's just units. Factor in price increases, all these "SLE" runs, and R&D saved by putting all toys on springs ( ), and it's probably fair to say revenue have doubled over that same time, while profit has probably been even better. JJP is knocking it out of the park lately, and the AP titles are awesome as well. I laughed at that too! it's probably fair to say revenue have doubled over that same time, while profit has probably been even better. But, but, but...why should we care about their profits and units? Having the largest and most relevant pinball manufacturer showing such great growth and expansion does nothing for the health of the hobby. Sorry, I was mocking people that make similar comments. 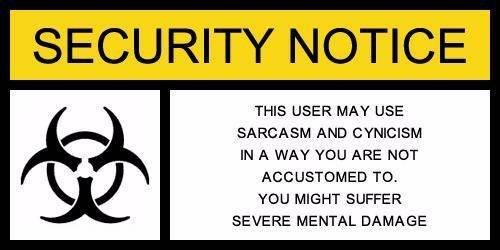 I should have included the following warning. I have updated my original comment. Sorry, I was mocking people that make similar comments. Yeah there's some real dry folks around here that need everything spelled out. Stern needs to start thinking outside their box... DP was not what I was expecting when I got to Expo, and it was a lost sale from me, however I am a HUO customer. Was not pleased with the lack of tie in with DP movies. Was not pleased with the toys (on springs lol), and swords in pinball is a rehash (LOTR), plus quality issues on the playfield craters... Not all Sterns are this weak, and it is an ok casual shooter machine, but the added gameplay of the LE is laughable compared to other Stern titles IMO. When faced with the selection of new pins to buy at Expo, BM66 would be a better purchase than DP, but it was CGC MB that was getting all the love, and it is kind of telling when a 20+ year old remanufactured machine outshines your latest new title. Boutique pinball and remanufactured pinball classics from a major supplier of coin op equiptment is competition, as light or as heavy as anyone wants to argue, it is still competition they need to worry about. Lets see how well they pull off Munsters and go from there. This is fantastic news for Stern and the hobby writ large. Keep the train rolling! In how many threads are you going to profess your love of Monster Bash? :applause:Doubled capacity, 325 employees, etc. Sales has to grow! When you make that kind of capital outlay, employ that many people and take that much RISK, you deserve to make whatever you can make profit wise! Supposedly 10k pins last yr and 12k this yr. Not bad. Pinball pricing? That will take care of itself through supply and demand. Nobody holds a gun to your head to buy anything. Not a Stern hater, not a total CGC fanboy, but there is the fact that CCC can and did at one time make all the cabinets for everything, plus playfields and backboxes... that is a lot of capability. You point that capability at making complete pinball machines, and the latest MBr says two things, we can put out just as flashy a title as you can, and we can ramp it up quickly, which is what the agressive schedule for MB production is all about. How many people just getting into the hobby know the history behind CGC and Churchill Cabinet Company and all the cabinets they made over the years? That is a testament to their ability to adapt and grow and change rapidly. Stern has manufacturing capability too, but they have development costs that are higher than CGC right now, so the direct comparison is not fair to Stern. We don’t know how CGC will fair doing original IP and are not just remanufacturing and updating old designs. But nobody seems to think CGC is serious competition, and I think IMO they are the most dangerous lurking competition to Stern, not API, or JJP, or Spooky, or Deeproot, or Mafia, or TPC, or Homepin or Multimorphic. They have deep industry ties, they know everyone in the supplier chain, they have preexisting arrangements with suppliers of a lot of coin op equiptment, and they know the industry inside and out. That is a lot of a head start. which is what the agressive schedule for MB production is all about. Aggressive? The game that was supposed to come out at TPF? HAHAHAHAHA! I love CGC and can't wait until my home remodeling is done to buy MBr. They make a fantastic product and I can't wait to see what they come out with next. 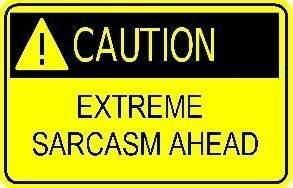 With that being said, your arguments are flimsy at best. Of course API and CGC were going to have a lot of hype at Expo! They unveiled games there when Deadpool had already been revealed. Of course you are going to have people lined up to check out the new hotness. CGC definitely has a leg up against just about everybody in the markets they compete in except Stern. Stern is the industry leader and are focused on volume. Until somebody can put out more than one game a year, they are not going to demonstrably cut into Stern's sales, which is a volume game. In a Spooky thread this weekend Charlie stated that they made 475 games this year (so far), which is a great accomplishment for them and is to be commended. However, using Ice's 12K number, Stern put out 25x that number this year. What everybody either does not realize or does not want to admit is that more competition does take away some sales from the leader, but hurts smaller players on average more. A theoretical 10% drop for Stern is manageable, but that same drop against a smaller manufacturer is more impactful. This is not pulling for or against anybody, just a statement of fact. @dblm, don’t disagree. But my point is CGC is a big huge lurking unkown in Stern’s gameplan IMO and if I were Stern, (which I am not) they would be who I was watching. Putting together a design team to rival Stern right now on throughput if nothing else is the hurdle CGC faces, and would be the only thing that keeps them from biting harder on Stern’s ankles as they make their way up the market share ladder. There is a lot of old and young tallent out there making new machines, but the hardest part, new games, new rules, new mechs, new art, new music, new fx... that takes time and a lot of money to get right. CGC is capitalizing on both nostalgia and prior art, but an original title will be the foil that tests their mettle, and that, as yet, is left unseen and a big unknown, and I am unsure if CGC is even going to go down that road with access to the old titles. Time will tell. I'm just stoked that pinball is doing well. I want all the manufacturers to stay profitable so I have more new machines. The brand war and trolling on here baffles me. CGC is a niche player thus far. They have now done 3 of what's considered the best pins ever. It can't go anywhere but down from here. Great quality and the price is right for what you get. But LCD video matters. You just can't really compete with Stern. 325 employees full time. CGC can't even get MBr out timely. Deeproot could make a dent but i highly doubt it. CGC is a niche player thus far. Niche, yes, but more like a giant bear sticking a little toe in the water... or a great white shark smelling blood? No idea what their play is other than niche remakes, but if they pulled together an original title that sold well, would you not keep a watchful eye on them? They could be the sleeping bear is my only point. Let's be serious, they simply don't have the talent to make it work. They have proven they can copy older games, that's it. Making pinball is "really F ing hard"! Deeproot is spending a ton of $$$, has old timer talent so let's see what happens but i highly doubt anyone can challenge the Stern machine with their 325 employees. Think about it. I think its Stern, JJP a distant second, CGC and AP way down the totem pole and then Spooky. Spooky can survive will boutique games and low overhead. 2019 is gonna shake a lot of things out for sure. You need IP and innovation to beat Stern. Copying old hot games is going to run out or at best as you start copying lower level games get you less sales. Maybe they should get back in bed with Stern and make Stern’s boutique games while Stern concentrates on the cornerstone games. This. I think CGC could/should be a high end contract manufacturer for the industry. JJP makes a great product but CGC could help them scale. For contracted games like Jetsons, they could offer more manufacturing economies of scale than a Spooky. They can focus on the Bally/Williams games as their own brand and contract manufacture for one to many others. Hardly, they are tapping into a market that is currently profitable and getting what they can. You are quick to harp on stern but stern has the best designers buy a mile. I guess you forgot that they have Brian Eddie with his first game since MM coming soon. Stern is trying to position themselves to literally crush everyone. We have Borg Munsters coming, Nordwin Elvira 3, Keith Elwin's second title, original theme buy Steve Ritchie, and whatever Brian Eddie is doing is likely to be gold. Found this picture of Stern’s development team. It might as well be those guys, they are chest slapping the competition silly. JJP cant get games made in less then a year, cgc remakes a game ever 2 years, AP has happy handed monkeys stopping their progress, and stern only has 5 killer titles lined up with several killer vault options to roll out whenever the so choose. @jgentry, not quick to harp on Stern as much as quick to point out what I think were mistakes... havent said I dont like playing or owning Sterns, because I own one. I like a lot of recent titles, but my disappointment with DP made me look at what else was becoming available, and just so happens CGC bring out MBr while we are at Expo in the market for a new pin. We play both and we bought a CGC remake. I would have come home with a DP if it had met our expectations but it didn’t. CGC took my expectation of what a remake of MB could be and showed me what should be. I don't give anyone a pass if they screw something up, and thats what DP felt like to me, a miss on the franchise. On the other hand, if you want to talk about generating fun without a lot of innovating going on other than good old ramps and targets and diverters, IMDN knocked it out of the park, and I have loved playing the crap out of it. If DP had been the same everything except had the layout of IMDN, played like IMDN, and was as much fun as IMDN, had Ryan Reynolds Callouts (wife’s big sticking point) we might have a DP in the house. You might ask why not just buy an IMDN? My wife likes exactly 1 song by them, and so that was a nonstarter, even though she agreed it was a fun shooter. How could you have went to expo thinking Deadpool has Ryan Reynolds call outs? It was pretty much known for 6 months it was comic book based. Sure, you dont like deadpool like you keep stating. Guess what, wait 3 months and stern will have another option for you. CGC is doing a good job, I'm glad more of those games are available for those that want them. Personally they do not excite me, been there, done that. It's funny to me that you praise someone that is really not designing anything but keep bagging on the company that is actually making new games. People better pinch their pennies because that MBr is going to take a big hit when everyone drops them scrambling for Elvira 3 and Jaws money. I love Deadpool and haven't had any problems with it, not sure what your problem is. You can also go spend an extra 2000 grand on JJP or CGC and have twice as many issues. Where are you seeing the quality differences? I legit love this. 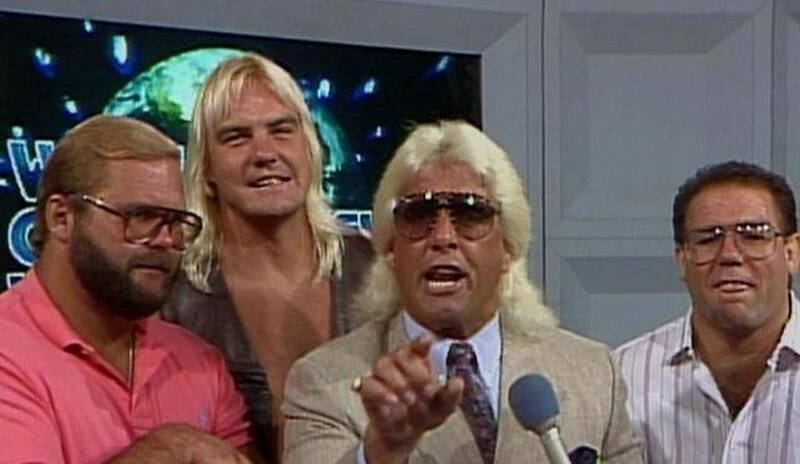 If the 4 Horsemen designed a pinball machine, it would be a giant picture of the smilin', stylin, limo-drivin' Ric Flair, Barry Windham looking bewildered until he saw the buyer and gave him a HUGE clothesline; Arn Anderson carrying the cabinet on his back, and Tully Blanchard cowering in the corner until he could get a swift kick in for not buying Stern! I'm guessing he hasn't owned a cgc game. They have had just as many issues as stern if not more. All of them have had their share of blunders. Best post on here and it’s blown right by, by all the brand trolls. Don’t get it either. All have their issues, all have setbacks. The bigger the company, the easier it is to hid the set back. As for myself. I like them all. Every new pin born is another game someone can play. DP has been out in the wild for a little bit, MBr and Oktoberfest were the new kids on the block. So understandably so. Not sure where that came from, but YEAH BOYYyYEEEe!!!! 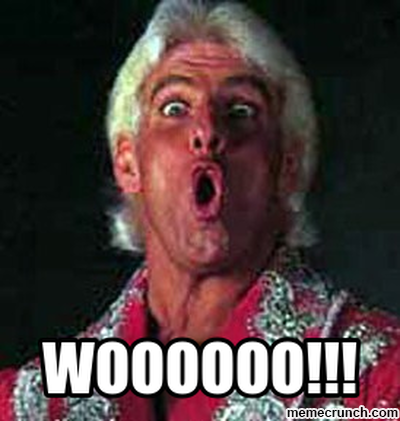 Ric Flair is the man! 2 quick Ric stories. When I was a kid, my dad was part of the Lions Club and got Jim Crockett Productions to do a house show in our small town on an off night when I was about 6. I watched them setup the ring and rehearse some matches. Ric noticed me, pulled me into the ring, threw me into the ropes, and gave me a chop, telling me to fall down. Was friggin awesome! Later in life, helped out my brother and Hermie Sadler (NASCAR driver) promote some TNA wrestling when Flair went there. Without a doubt, never have partied with somebody like him in my life (and I have been drinking with John Layfield and Ron Simmons)! 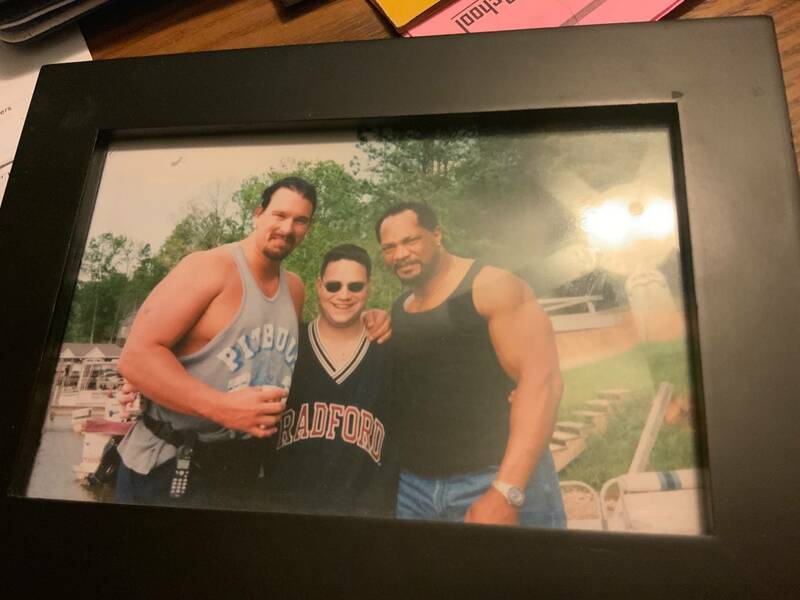 Just found this pic of me, Layfield, and Simmons. Was spring of 2000 or 2001. At this point, I am 5”11 and 230 and they make me look small. Check out the beer can in Layfield’s hand. They drink no joke a 24 pack each and then went and wrestled that night. Unbelievable! It sounds like Ric is a cool dude. Besides making me laugh, remind me again what he has to do with Stern? He is the Stern of pinballs! Sure it's grown. What in any of the comments made you think anyone thought it hadn't? It CLEARLY has. That still does not mean that the other manufacturers aren't cutting into game sales. The pinballs on some people. Panzer do you really think JJP is crushing it really? Like the "phone" on belt.